if you must). Then I started working for a beauty website where I became really great at painting my left hand... but I couldn't blog about it because, ya know, competition. So now that I watch babies for a living and do pretty things for funzies, I thought I might ease my way back into it. I mean, if you're into it.. 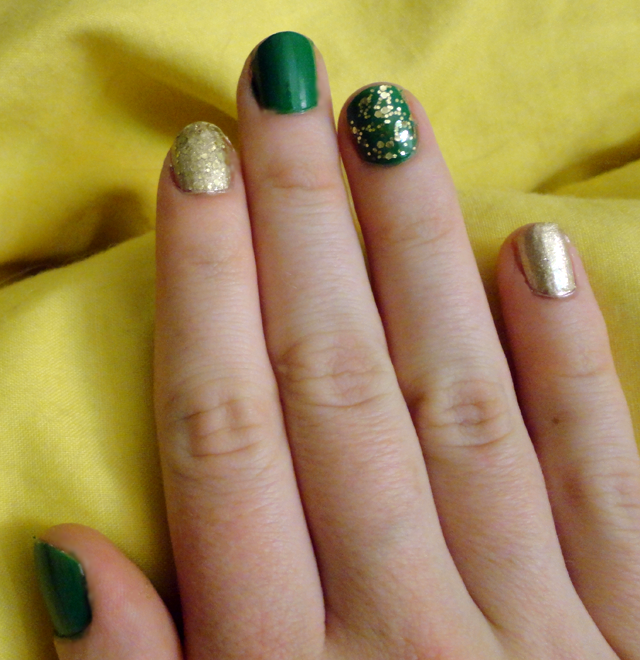 So here are my simple, yet somehow-I-made-them-complicated St. Patrick's Day nails. The complicated part comes in when I used the essie copper + Rimmel gold to make a solid gold color and then went ahead and added Candie's chunky glitter gold to make it even more prettiful. 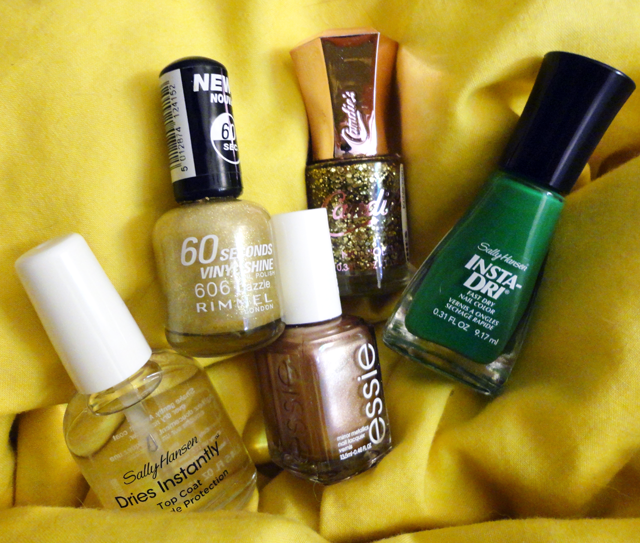 I just discovered Sally Hanson's Dries Instantly Top Coat and it's not even playing around. Within 30 seconds I was doing things with these nails that I normally wouldn't consider doing within 5 minutes of painting them with normal polish (think unzipping pants for a pee break). And in case you didn't already know about my affinity for asymmetry, check out my other hand which was quite the opposite of the other one. It might not be the most complicated way of painting your nails, but I thought it was pretty adorbz. 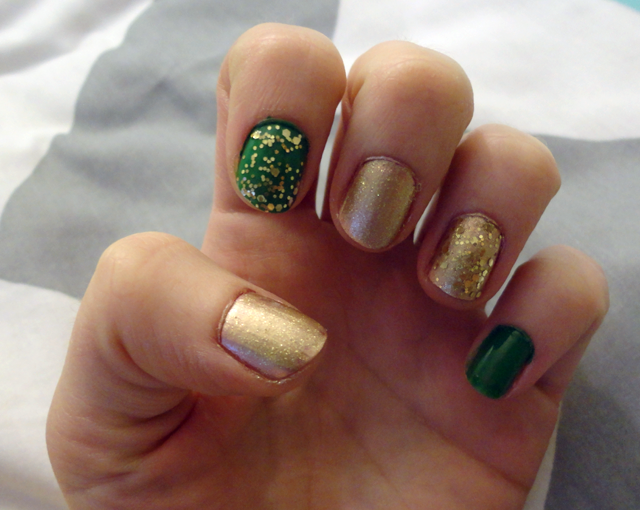 Let me know if you guys got all cray cray with your nail art for this St. Patrick's Day. I would love to see it. Enjoy and drink lots of green colored liquor/beer for me. Be safe. Byeeee. Look at you Girl, rocking' the shade of green! Your nails turned out super cute, I love them! I still haven't painted my nails.. my current nail polish is crazy chipped and annoying ha ha. Oh no, your first post was hideous. Like, this website hideous: http://pinterestfail.com/ <3 this is beyond cute though! I love it. I wish i could paint my nails this well. i paint them like every other day and still end up with a hot mess all around them that takes a lot of qtips and remover.